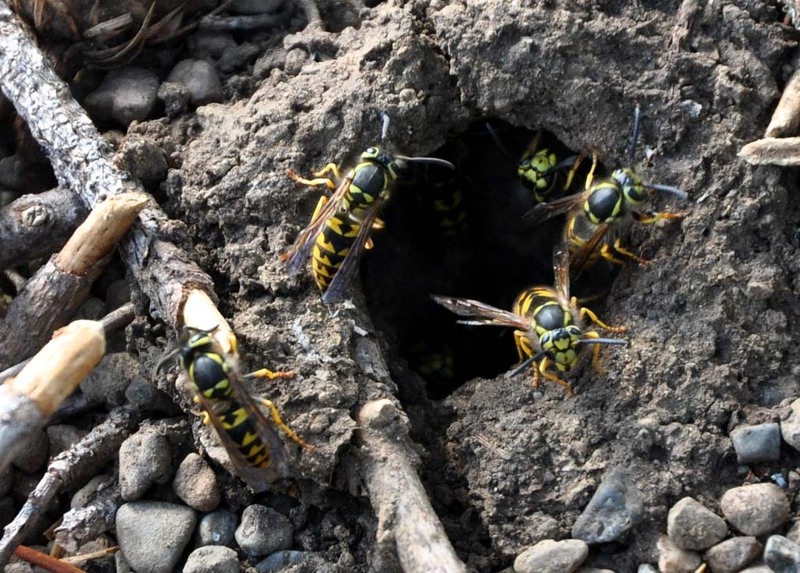 Paper Wasps, Polistes aruifer, construct open to the air cellular type nests. The Bald Faced Hornet, Dolichovespula maculate, makes a round, classic looking hive that can become quite large if left undisturbed. The Western Yellow Jacket, Vespula penslyvanica, finds a home underground, normally in an old rodent burrow or something similar. Another distinguishable characteristic of the Yellow Jacket wasp is a head completely outlined in yellow. 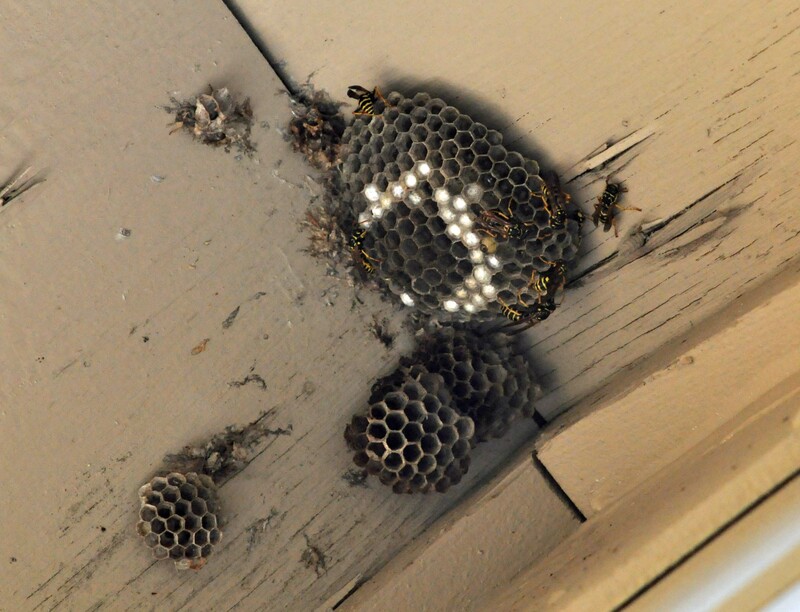 As the weather heats up here in the Northwest you are sure to notice a sudden abundance in bees and wasps. In general bees are not nearly as aggressive as wasps and are easily recognized by their distinctly different body shapes. Bees are round bodied, hairy insects specifically designed for maximum collection of pollen. Wasps have longer, streamlined, naked bodies and tend to feed on other insects, and even carcasses of dead animals. They also display a notably more cantankerous disposition than bees. It’s this difference in attitude that makes wasps fairly unwelcome visitors while you’re out and about enjoying the summer sun. Topping the list in aggressive behavior is the Yellow Jacket. These easily irritated insects nest in underground lairs, often in old rodent holes. So if you notice some buzzing insects that seem to pop out of the ground – watch your step. It could very well be a nest of Yellow Jackets. 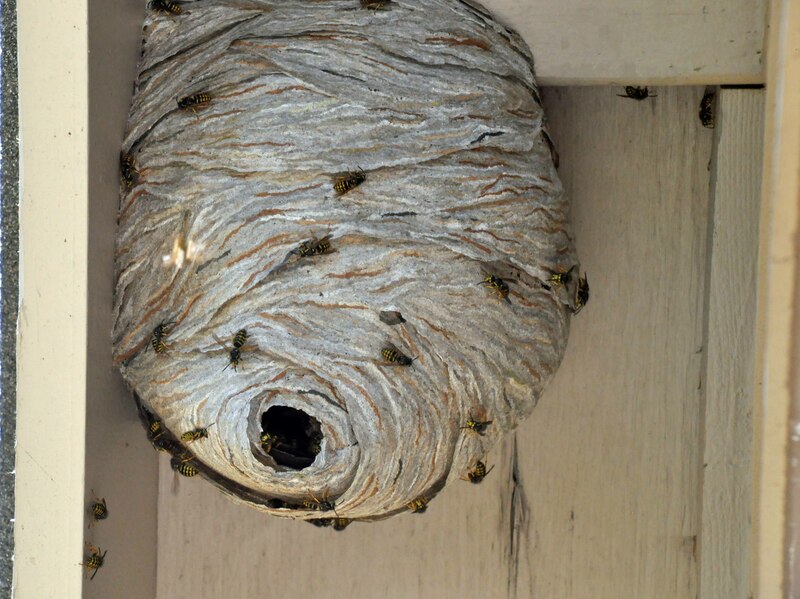 Under the eaves of your homestead you are likely to see two other common members of the wasp family, Bald Faced Hornets and Paper Wasps. Neither of these species have a particularly aggressive disposition but they will vigorously defend their real estate if sufficiently provoked. As noted by Arthur Evans in the National Wildlife Federation “Field Guide to Insects and Spiders of North America,” the names of these wasps are a bit confusing considering the nests they build. Bald Faced Hornets build large globular nests that much more resemble paper than the open faced cellular nests of Paper Wasps. So there is your quick guide to wasp identification. Now the next time you hear somebody lump all of these insects together as Yellow Jackets you’ll be able to make an on the spot correcting (if necessary, of course).